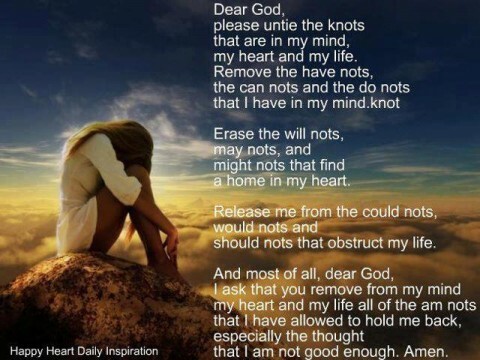 Are there any “nots” in your life? Have you ever wondered whether you are good enough for God? Have you asked Him if you are good enough to get into Heaven? The answers to these questions are simple: yes, you are good enough for God and no, you are not good enough to get into Heaven! Well, why not? Why am I not worthy to get into Heaven? It is because of our human nature and the fact that we are sinners from the time that we know right from wrong. Can we change? Yes, but not on our own. Only by accepting Jesus into our lives and allowing Him to change us from our heart outward can there be any lasting change. This kind of change makes a difference not only in our lives but through our lives we are able to touch others because of it. The change in us will be evident to others and they will want what we have because it gives us hope and peace. A peace that those in the world cannot understand. Your life can be so much more than it is with Christ in it and yet, many people don’t want Him in their lives. To me, that doesn’t make sense but that is how life with Jesus is. If you have Him you can’t understand why anyone wouldn’t want Him. If you don’t know Him, you can’t understand why anyone would want to. The idea that a rabbit has anything to do with Jesus’ resurrection came from a pagan ritual. The truth and the reason that we celebrate Easter is the resurrection of Jesus after His crucifixion! It has nothing to do with the spring of the year or eggs or rabbits but it has everything to do with your salvation! Jesus died to ransom you from the penalty of your sins, regardless of what those sins are! It doesn’t matter if it is a lie that you told your Mom or your boss or your wife/husband, even that is a sin. It may be considered a small sin but in God’s eyes and in His universe this is no different from murder. Sins are just that, sins, regardless of the severity or consequences in our world! To a holy God, our God, sins are all the same regardless of the effect they have in this world. This is a hard message to hear and to learn but it must be said because there is an eternity at stake and it is yours and mine! Think about what God might feel. He created all of us as His children, to learn about Him, to decide on our own to love Him because of what He does for us on a daily basis. Then, when we decide not to love Him and sin against Him, He feels it like a knife every time. Not just from one of us at a time but from everyone on earth! We won’t be perfect even after we accept Christ as our Savior but we will have His righteousness to cover those sins that we do commit! We will still sin but we will know it, the Holy Spirit will let us know and we will want to follow Jesus’ footsteps toward the Father. If you haven’t allowed Him to change your heart and your life, please consider this…the fires of hell never go out and after your life on earth is over you will live forever regardless of where you are. The eternal life that you live will have much more meaning and purpose if you serve Him now so you can serve Him then. If you choose not to allow Him into your life while you have this time on earth, (since we don’t know when our time ends we may not have another chance), your eternity will be very different from what it could have been! Satan doesn’t care about you or your life other than getting you to choose not to follow Christ, as long as he can accomplish that he feels that he has hurt God more each time one of us chooses our own way instead of God’s way!